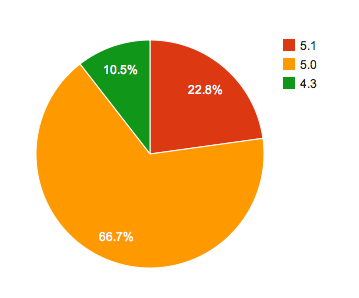 We have started to conduct surveys to see the deployment of iOS 5.1 amongst our users. In one short week, iOS 5.1 has already reached a staggering 22.8%. Now our sample pool is fairly small; however, it is nicely distributed by country and iPhone vs iPad so it should be pretty close to the masses. We will try to update those statistics every week for the next little bit so come back and check.